Attorneys representing women who claim they were sexually abused by USC campus gynecologist Dr. George Tyndall announced Thursday they have filed dozens more lawsuits accusing the university of ignoring complaints about the now-former campus doctor for years. The attorneys, joined by more than a dozen alleged victims of Tyndall, also called on the California attorney general's office to conduct an investigation into the university's handling of complaints about the doctor's conduct. 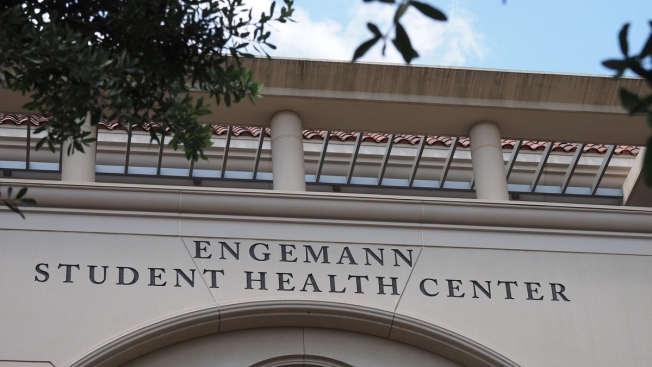 The lawsuits claim the university had received complaints as far back as 1988, but Tyndall continued practicing at the student health center until 2016. "We call on Attorney General Xavier Becerra to commence a serious investigation of USC -- not George Tyndall, because the [Los Angeles County District Attorney's Office] is handling that -- but USC,'' attorney John Manly said at a downtown Los Angeles news conference. "The University of Southern California, my alma mater, is the recipient of hundreds of millions of dollars of state of California aid, and it is clear they miserably failed these women,'' he said. Manley and attorney Andy Rubenstein said they filed 93 additional lawsuits this week against the university alleging wrongdoing in the handling of the cases. Tyndall and USC have been sued by hundreds of alleged victims, many of whom claim they were inappropriately fondled or photographed by Tyndall under the guise of gynecological exams. Many have also accused him of making sexually charged comments during the exams. Alleged victims have contended that the university received numerous complaints of Tyndall's alleged sexually abusive behavior, dating back to at least 1988, and actively and deliberately concealed Tyndall's actions. Attorneys for some victims have argued that following an internal investigation of complaints against Tyndall in 2016, the university paid Tyndall a substantial financial settlement so he would quietly resign. USC officials have denied any coverup and Tyndall has denied any wrongdoing. In an open letter to faculty and staff in May, USC Provost Michael Quick said top administrators did not know about the complaints until 2016. USC established a hotline for complaints about Tyndall and has offered free counseling to his former patients. At Thursday's news conference announcing the latest lawsuits and calling for a state investigation, nearly 20 alleged victims of Tyndall told their stories and called for more changes in university administration. "If USC had done its job and investigated the complaints against George Tyndall before I was at his office, I would not be standing before you today,'' said Dana Loewy, who claims she was molested by Tyndall in 1993. "I am part of an accidental sisterhood of hundreds of women because the university we love betrayed our trust. It is inconceivable to know that USC first because aware of Dr. Tyndall's crimes as early as 1989 and I was able to walk into the student health center with him as my doctor years later." Manly said he believes Becerra, who is "in charge of nonprofits in the state of California," should investigate. "We hope and pray and we think he will look into this, and if there was wrongdoing by the administration at (USC), and we believe there was, that they be held accountable,'' he said.